You must improve the structure of URLs so that search engine understands main content of your blog easily rather going to your main page. Also, your site should be navigated easily by the user and the search engine. You must create descriptive category and file names to keep your website documents organized. Also, it will not just keep the documents of your website organized but also it will be useful for the search engines to crawl your page easily. You must create friendlier URLs so that the user can link the content of your page to other pages. Also, the friendlier URLs is the essential part of your post so that readers can find recognizable words of their search in their URLs rather a long and confusing URL. Generally, long URLs are hard to remember for the user and they cannot create link with long URLs. Also, users may find some portion of the long URLs unnecessary and while linking that URL they may leave some portion. They might leave that portion of your post URLs which results in breaking of URLs. Sometimes, users link the URL of your page in an anchor text. If the URL of your page contains relevant words then it becomes easier for the user and search engine to crawl your page rather crawling irrelevant parameters of URL. Remember that the URL of your post will be displayed in the search engine’s result below the title and snippet. Like title and snippet the URL of your post will also appear in bold letters. The words in URL should not appear like ID or irrelevant parameters it should display the sneak peek of your content. Google can crawl any type of URL structure, but you must spend some time to make your URL short and simple so that it can be easier for both user and search engine to search your page. Even many webmasters always spend their time to convert their dynamic URLs into simple one, but if you follow this advance procedure incorrectly then you might face crawling issue for your site. You must use the relevant words in your URLs and should improve the structure of URLs. The structure of URL must be friendly so that the user can navigate it easily. If users find it easier to remember then they might link your page. You must avoid unnecessary parameters in your URL and make it as short as possible. Don’t use generic names and excessive keywords for URL. Avoid using session IDs in URLs so that the structure can be friendly. Use simpler directory structure so that you can keep the contents of your page organized and users will know where they have landed in your page. You must avoid long nesting of subcategories like “dirx/diry/dirz.html”. Don’t use irrelevant directory names which have no relevance with the content of directory. You must take care of providing the different versions of URLs to different users; this can divide the reputation of your content. You must focus on referring just one version of URLs. If you find users are accessing the same content from multiple URLs, then setting 301-redirect is the best solution for the non preferred URLs. You can also use canonical URL or link element URL if you don’t have any idea of redirecting it. You must avoid the same content of your page coming from sub-domains and root directory. Don’t use uppercase letters in URLs; as people generally remember lower case letters of your URL structure. How to make your site navigation easily? Navigation is the important part of any website where users can search the content quickly for what they are looking for. On another hand, it also helps search engines to understand the webmasters thinking’s. As we know Google display the results at page level, but Google keeps in mind what role the page is playing for the website. 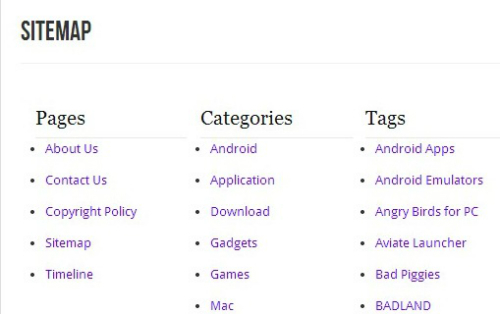 All the sites have one root page and various categories and sub categories pages. Although, the root page or the home page are most often visited and navigated. But, if you page have many sub pages then you must think of driving the visitors from main page to sub-pages. You must plan out some internal structure of your page where you can create a sense of bridge between users or search engines and you. Breadcrumb list is a row which gives internal links from top to bottom of particular site. This list is very much helpful for the users so that they can navigate quickly from your main page to sub pages or vice versa. Generally, breadcrumb list have the root page at the top then at bottom the links at the left and specific content of your pages at the right. You must allow some flexibility for the user to remove some part of URL. Some users will try to find the content of your page in odd ways. Suppose the URL is www.ebuzznet.com/website-hosting-resellers-what-consumers-need-to-know. If the user remove the part of URL and make it like www.ebuzznet.com/website-hosting then they should get the same content or 404 (page not found) error? A sitemap is the simplest page where the complete structure of your website can be displayed. If visitors are having problem to visit some of your page then they might visit your sitemap page. Search engines also visits this page, as it gives the good coverage options to crawl. It’s mostly designed for human visitors. An XML sitemap is the most important page of your site from where Google can search the contents from your site. Using this type of Sitemap file is the best way to indicate the Google which part of your site to be referred as canonical one. You must make the internal list of your page as easy as possible for the user to navigate from one page of your site to another page. You must add navigation pages wherever needed and must work constantly o internal structure of links. You must avoid the complex structure of linking the pages and don’t just go on adding the click per page. You must create simple site map page which should link with all the other pages of your site. Also, XML sitemap file is very much essential as Google can search the content from your site easily. You must update your HTML sitemap file and don’t allow to link to get break. Also, create the organized sitemap for our site. Users generally type broken or invalid URL and land the non-existing page of your site. You must have 404 redirect page where the user can go back to home page or the most popular page of your site. It enhances the user’s experience towards your site. You must avoid that our 404 page should not get indexed in search engines. Don’t provide the messages like “error”, “Not found”. Don’t design the 404 page that doesn’t matches up with the other page of your site. You’ve some good points there – make life easy for the end user. I’m not sure why you’d have multiple different addresses for the same page for whatever reason – that’s just making work. If people try to shorten your URL by knocking odd words off here and there, it should be of no surprise to them when they get a 404.